An airfield was established in the 1940’s during WWII as part of military operation POTSHOT. In the 1950’s it was redeveloped as a RAAF base to provide fighter defence for the Australian and USA troops based on the North West Cape. Learmonth Airport is named in honour of Wing Commander Charles Cuthbertson Learmonth, a decorated WWII RAAF pilot awarded a Distinguished Flying Cross (and bar) whilst leading the 22 Squadron RAAF during its attack on a Japanese destroyer in the Battle of the Bismarck Sea in March 1943. He also flew in the air search for HMAS Sydney, fought in the New Guinea air war and trained many other WWII RAAF pilots. Wing Commander Learmonth died whilst commanding a 14 Squadron RAAF Beaufort Bomber during a training flight between Pearce and Rottnest Island on 6th January 1944. His account of the problems he encountered immediately prior to his fateful crash provided the answer as to why as many as 93 Beaufort Bombers had suffered similar crashes and fatalities prior, and it is for this that RAAF Learmonth base and Learmonth Airport is named in his honour. The Shire of Exmouth operates the civil airport located within the RAAF Learmonth base. The Learmonth Airport is situated on Commonwealth land and owned by the RAAF under the Department of Defence. The Shire leases the Learmonth Airport from the Department of Defence under a Deed of Operation. The Learmonth Airport lease area covers 23.9 hectares (ha) and is a Security Controlled Airport (SCA) with a Classification 3 under the Federal Aviation Transport Safety Security Act 2004. The airport is situated approximately 36km South of Exmouth and 120km North of Coral Bay and services Qantas passenger aircraft as well as helicopter operators supporting off-shore oil and gas operations. 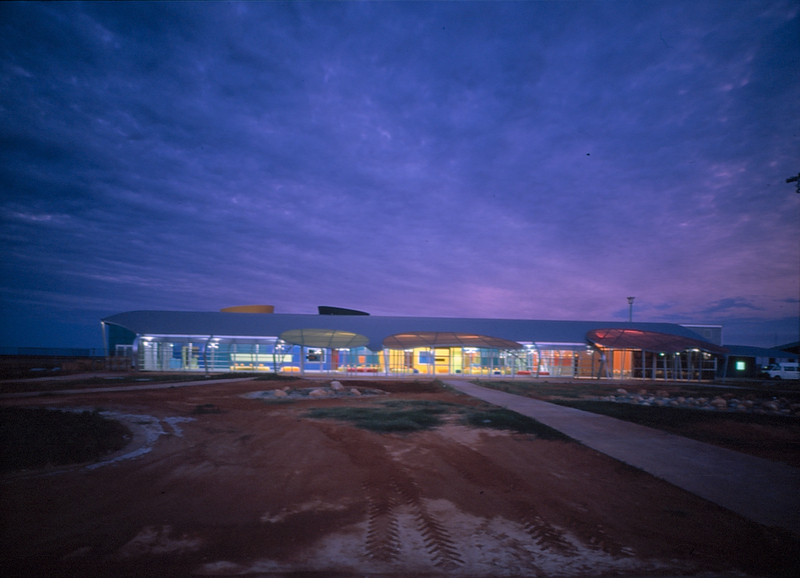 The terminal which opened on 3 December 1999 has won a number of Royal Australian Institute of Architects awards for its innovative design which represents a coral reef.